Driving to hockey training on Wednesday, it crossed my mind: is this a good idea? On Tuesday, I head to one of my favourite places in the world, Lady Elliot Island, a tiny speck off the coast of Queensland at the southern base of the Barrier Reef. Mackquist and I are going to dive for a week with the manta rays, and hopefully a whale or two if one passes while we’re underwater (which can happen at this time of year). 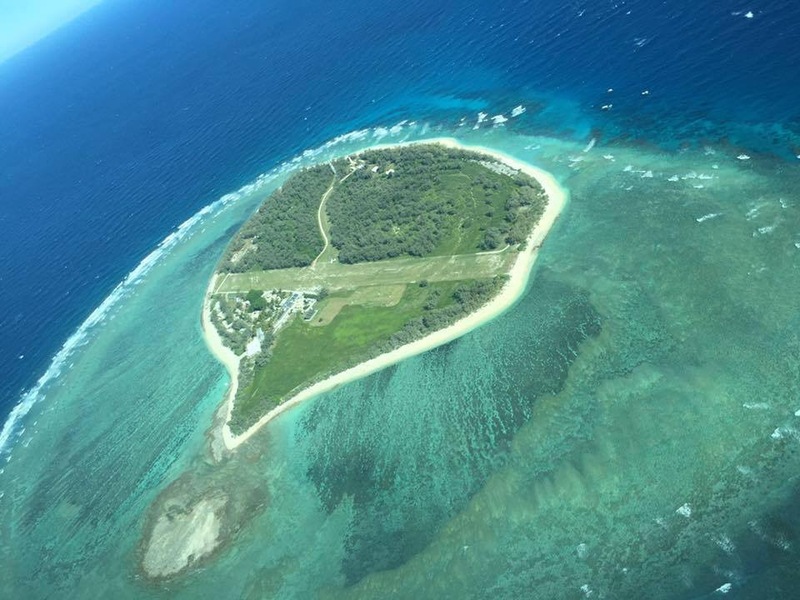 Lady Elliot Island – so small that the strip across the middle is the runway. It’s peak manta season and I can’t wait to get on the plane, to see if you can really leave Victorian winter and be in the warm Queensland waters with up to 30 or more mantas at a time. So, driving to training, the thought strayed into my brain that this would not be a good night to hurt myself. But just as quickly, I dismissed it, thinking: you can’t live like that. I’ve skated constantly now for more than four years and have mostly been okay. Why should a standard Wednesday Intermediate class be any different? And so yes, you know what happened. About ten minutes in, Tommy Powell calls for two quick laps and off I go, skating as fast as I can. I actually love those fast laps: they kill your legs and lungs, but in a good way. It’s the best cardio workout I get all week. And so I throw myself at them. If I’m not the fastest skater out there, and invariably I’m not, at least I’m working hard. Right up until a goalie was stretching near where I had to turn left, to pass behind the goals, and that made my turn a little sharper than I had planned, especially at speed, and before I could process it, I’d lost an edge on my skate and I was down, bouncing off the ice and careering, completely out of control towards the boards, less than two metres away and closing fast. This is NOT how you want to hit the boards. 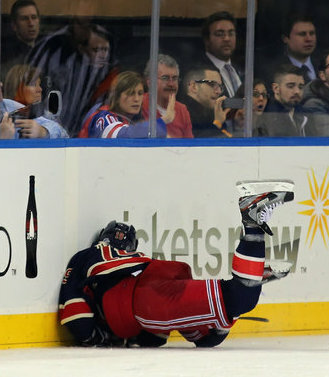 Somehow, New York Ranger Brad Richards came out of this okay. Pic: Getty. Without trying I can think of five cases where I’ve witnessed a hockey player in this situation end up with a broken leg or collar bone. I can think of other lesser injuries, but still significant ones from uncontrolled slides into the wall. I’ve had it happen a couple of times and had a badly hurt shoulder/upper neck from one of them. All of this somehow had time to pass through my mind in the micro-seconds before I hit the boards. I’m sure I’ve written in this blog before about once doing laps with Bathurst-winning racing car driver Jim Richards. I asked him: what’s it like when you go sideways and you know you’re going to hit the wall? What passes through your mind? He stopped, squinted, thought about it and said, surprisingly, that he’d never been in that situation. I said: you’ve never hit a wall? And, to paraphrase, he said: no, I’ve hit plenty of walls, but here’s the thing … a racing car is an incredible piece of machinery. It can do things that a normal car simply can’t do. And I am a highly trained, expert driver, so I can drive that car in a way people normally can’t. So, if things have gone pear-shaped, I am doing everything I possibly can not to hit the wall … right up until the actual moment that I hit the wall. If I think about it, it’s always a bit of a surprise to hit the wall, because I was concentrating, working so hard not to, and then oh wow, I hit the wall. Another nasty board collision. You do not want to lose an edge while heading towards the wall. But on Wednesday night, this all went out the window. Skates off the ice, 85 kilos of full body momentum sliding across the surface, at velocity, with two metres or less to stop, and no way to brake, I had no hope. And I also somehow had time to think: do NOT stick out an arm or a leg to take the hit. I was a relaxed ironing board in armour when I collided – and it was a beauty. I hit the boards hard. Helmet took it. Right shoulder took it. Knee took it. But a miracle. No joint got bent the wrong way; my helmet did its job. Two days later, I’m completely fine; a vague dull ache in my shoulder but nothing to stop me boarding a plane and diving. Later in the session, I went for a puck from one direction as a classmate came fast the other way. Again, the collision was a big one. Again, I skated away, intact. Today I got an email from one of my brothers at the Bang, our social footy group. He wanted to know if anybody wanted to play in a real game of Aussie Rules, to help a team he knows make up numbers, this Saturday only. No, I wrote back, as quickly as I could type. No, I will not be putting my body in line to twang a hammie or do a big knee. Not with Tuesday’s flight looming. For once, just this once, I am letting myself be grateful I survived Wednesday’s big hits and I’m voluntarily putting myself in cotton wool between now and Tuesday. It’s all about Mackquist, the mantas and me.